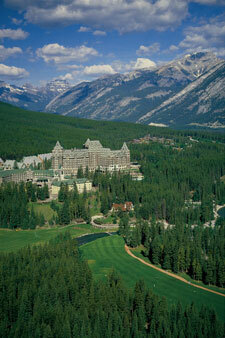 What is it like to golf the Stanley Thompson golf course at the Fairmont Banff Springs Hotel? 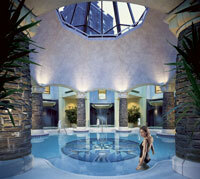 Travel Alberta's article "Banff Spring's Eternal" provides you with a few interesting details and a little atmosphere. Designed in 1928 by Canada's most revered golf course architect, Stanley Thompson, this incredibly scenic golf course was the first golf course to cost $1-million. It was money well spent, and today Sports Illustrated calls the Banff Springs (along with the Jasper Park Lodge Golf Course) one of the two greatest mountain golf courses ever built. With the Fairmont Banff Springs hotel serving as a castle-like backdrop, elk grazing on the fairways, towering mountains looming overhead and the frothy c fringing the golf course, the Banff Springs is truly a one-of-a-kind golf adventure. Justifiably mentioned in the same breath as Pebble Beach and the Old Course at St. Andrews, the Fairmont Banff Springs Golf Course serves up an enchanting combination of raw mountain splendor and wonderfully challenging golf. 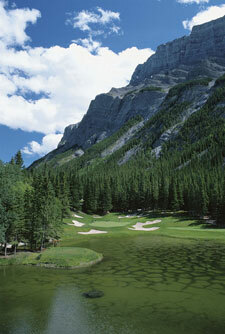 The source of the magic at the Banff Springs Golf Course is unquestionably Stanley Thompson. Renowned as Canada's foremost golf course architect, Thompson's genius is recognized worldwide. 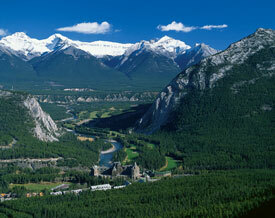 When the Banff Springs Golf Course opened in 1928, his legendary status was forever etched in the annals of golf lore. Thompson's vision included 18 championship-caliber holes played along the face of two massive peaks – the 10,000 foot Rundle Mountain and the broad Sulphur Mountain. Starting at the Fairmont Banff Springs Hotel, the course lines up against the mountains and winds past the raging Bow River as it exits the Rockies. In the 1990s, another 9 holes were added, this time featuring Tunnel Mountain, and the full course now boasts 27 world-class golf holes. The Thompson mystique lies in his ability to position greens in locations only a genius could conceive, and to place bunkers in spots that are at once challenging and inspiring. The golf course took six years of backbreaking work to construct, with trainload after trainload of soil and sand brought in to transform the terrain into its wondrous form. Of the many impossibly scenic holes on this course, one manages to stand out. That is the Par-3, 4th Hole, known affectionately as the Devil's Cauldron. On a clear day, you can see thousands of balls shining from the bottom of the crystal clear lake that rests between you and the hole. Challenging just begins to describe this picture-perfect golf hole. In 2000, Golf Magazine voted the Devil's Cauldron one of the 18 best holes in the world. 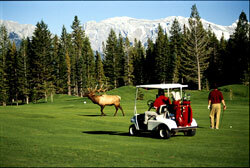 Playing the Banff Springs Golf Course also means sharing the course with some four-legged spectators. 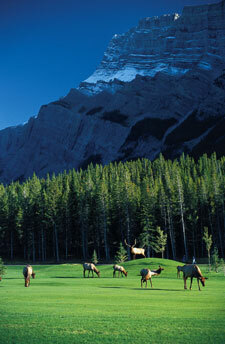 Grazing elk are a natural obstacle here, with as many as 50 sometimes foraging on your fairway. Respect must be given, but there are seldom problems with these stately creatures, whose picture you can see on the reverse of the Canadian 25-cent piece*. Of course, the gothic Fairmont Banff Springs Hotel is present on the course, too, watching over your shots like a silent sentinel. It's the perfect place to stay if you're golfing here, and also a special place to visit for dinners, drinks or even spa treatments, at Canada's largest – the Willow Stream Spa. Just up the hill from the hotel, you'll find the natural hot springs that gave the hotel and the golf course their name. And although the original Cave and Basin baths are now closed, if you're looking for a relaxing soak after your round, you'll want to head to the Banff Upper Hot Springs. Here, you can luxuriate in the natural mineral waters that flow from deep in the earth's belly, as you look back fondly on a truly remarkable golf experience.